Tells of the evolution of religion in ancient Egypt and the great reforms of two amazing men: Imhotep and Amenhotep; with numerous maps and illustrations of the gods honored in the Old Kingdom. Under the influence of Imhotep, who was grand Vizier under Djeser, there appeared a new spirituality, accompanied by an awakening of individual conscience. At Tell El-Armana, the pharaoh Akhenaton wanted to re-establish the spirituality of the Old Kingdom and started the cult of the ONE sun god as the Great, Invisible and All-Powerful God. This tells the history of ancient Oriental religions: in Mesopotamia, Assyria, Persia and India. We see the different gods honored in ancient Sumer and the chronology of religious life of these times. Then came a period of invasions and estrangement from religion. With Cyrus, came a return to true spiritual values. We study Hindu spirituality : the evolution of Vedism into Hinduism and Buddhism. This is a homage to the two-thousandth anniversary of the birth of Jesus Christ. Here is a complete synonpsis of His life and work, according to the four evangelists, and the significance of this message for our time. 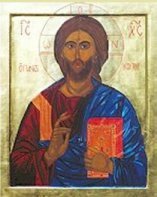 Some new details concerning the resurrection, the transfiguration and also the spread of Christianity in the first century A.D. The history of Palestine written one century before Jesus Christ, by Flavius Joseph. The different periods that Palestine went through, and the reigns of the kings before the Roman occupation. We also study the Roman conquest, and the takeover of power of Herod the Great. He had an obsessive fear of losing his throne, and his long reign was marked by many achievements, (both good and bad !) We see Palestine at the time of the birth of Christ and a special inset: the first KINGS of Israel, Saul and David. This is a study of the different references to the Bible (Old and and New Testaments) in the Koran, and research into the common points between these two sacred books. The most beautiful excerpts of the Koran that sing the Glory of God, and call for tolerance and the sharing of all the fruits of the earth with one's neighbor. There is also a commentary discussing the possibility of a fusion between these two montheistic religions. 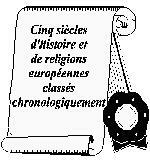 Follow more than 5 centuries of Mediaeval European history. There is an account of the principal European dynasties and the prominent events of this period: an overall look at the Crusades, the 100 Years' War, the mysteries of Joan of Arc, the Spanish Inquisition and the beginnings of the Protestant Reformation. All through this site, we note the enormous influence of the Christian clergy, with its often evil motives, and thus its unworthiness to transmit the true spririt of Christ.